Mix egg yolks with half of the icing sugar for about 7 minutes, until the mixture is fluffy. In a separate bowl whisk egg whites with the remained icing sugar for about 7 minutes, or until the mixture is shiny. Sift and mix well together flour, cornflour and cocoa powder and leave aside. Very gently combine the egg yolks with the egg whites. Delicately add the flour mixture in 3 parts and mix in using spatula. Pour the whole mixture into the cake mold and bake for 35 minutes. In a bowl over the pan with hot water melt broken chocolate. With a spoon combine a warm melted chocolate (not hot!) with mascarpone cheese. Whip the cream with sugar until very stiff, then gently add to the chocolate mixture. Keep it in the fridge. When the sponge is completely cool, slice it into 3 layers. Each layer sprinkle with a mixture of 2 tsp of vanilla extract and 2 tsp of green tea. 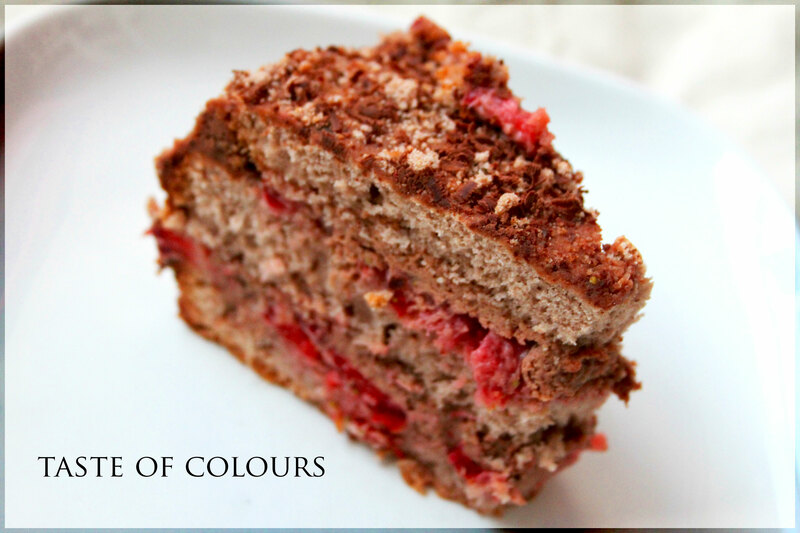 Place one of the layers on the cake stand, cover with slices of strawberries, then a layer of strawberry mousse and spread with chocolate mousse on the top of it. Place second sponge cake layer on top, sprinkle with sliced strawberries, strawberry mouse and cover with a layer of chocolate mousse. 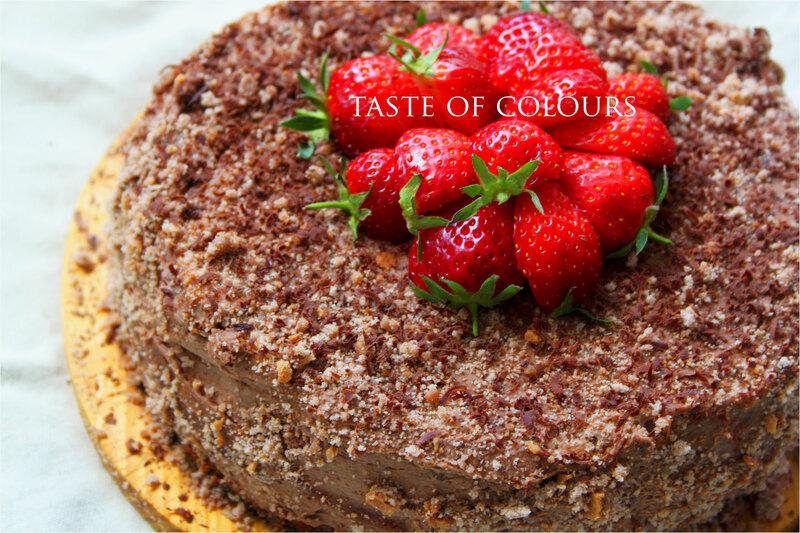 Spread the rest of the chocolate mousse on the top and around the sides of the cake, decorate the top with the strawberries and cover the sides of the cake with crushed biscuits. This looks beautiful…almost too good to eat! Your torte came out beautiful! I just love chocolate with strawberries. I think this would be great with raspberries rather than strawberries, and will try it that way. Looks wonderful. That looks so amazingly delicious!! Oh this looks fantastic! I’ll definitely be trying it sometime soon, thanks!! Oh this looks fantastic! I’ll be trying this sometime soon, thanks! !